This three-floor nightclub has been the place to see and be seen, to hear and be heard since the 1960s. It’s the absolute best place in town for live music, which you can listen to while chowing down on free pizza during Saturday Happy Hour from 4 to 8 p.m. – or when you attend a concert, with acts ranging from Dave Matthews to Snoop Dogg. 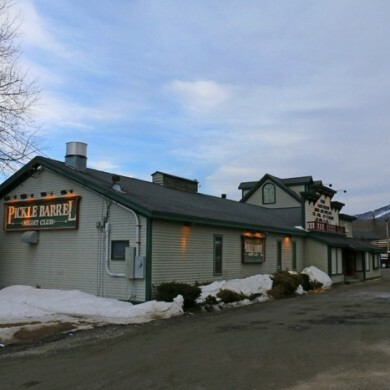 Four bars, 3 stages and 2 dance floors help the Pickle Barrel live up to its reputation as ‘The House That Rocks Killington.’ It’s a favorite among the young college crowd, but don’t let that discourage you. No matter your age or musical inclinations, you’re in for a fun night. So drag yourself out onto the dance floor, and let loose. As the story goes, the Pickle Barrel began as a rustic dance hall called the Sugar Shack. Later, as the Showcase East, it played movies and served drinks. In 1971, local entrepreneur Jack Gigure crashed his car through the front door. He then cleaned up his mess, gave the club a cheeky name … and changed nightlife in Central Vermont forever. Rebranded again in 1999 by Chris Karr, the Pickle Barrel is still the region’s best place to party, called a “Living Legend” by Ski Magazine. Your average Pickle Barrel-er will be dressed in flannel, boots and a beanie. You may stand out in your ‘city’ clothes, so if you want to blend in, keep it casual. Depending on when you visit, you could hear anyone from rock legends to up-and-coming singer-songwriters. Check the events page to see who’s playing during your stay. The Pickle Barrel has a loyal local following, mixed with weekend warriors in town to ski. It’s very relaxed and very close to the lodge … so you can walk home if you have a few too many barrels. Note: After the Bear Mountain Mogul Challenge is complete, the Pickle closes Sunday through Thursday for the summer season. When in doubt, call for hours or events. The Pickle Barrel is located at 1741 Killington Road in Killington VT. For more information, please visit the Pickle Barrel website or call (802) 422-3035.